We’re sorry to see August go. No more weekends down the Jersey Shore or weeklong jaunts to Chicago by way of Japan (don’t ask) until next year. In case you were OOO more than we were, here’s a look back at the month that was, complete with breaking backstage beauty news (T minus 12 days to NYFW), our favorite product picks, and a couple of high-profile Q&As, too. More news about Emma Watson’s much discussed new pixie cut has surfaced. Word on the street is that the Harry Potter star and Burberry muse cut her locks for a chance at the lead role in the highly anticipated film version of Stieg Larsson’s The Girl With the Dragon Tattoo. Carey Mulligan is also reportedly in the running to play the spiky-haired part of Lisbeth, and seeing as how she’s got a few years on Watson in the pixie-cut department, she may have the advantage. A new study contends there’s an ugly side to being a pretty woman—if you’re going after a particularly masculine job, that is. Whether or not you find the prospect of working as a prison guard, car salesperson, or construction supervisor appealing, inequality in the workplace in the twenty-first-century is still totally intolerable. President Obama has slipped up. A few months ago, he joked that Snooki and JWoww would be excluded from the nationwide tan tax that went into effect in June, but during his recent appearance on The View, he claimed not to know who Snooki even was. “I know he knows who I am. He has to stop lying,” the Jersey Shore sun worshipper has quipped. The President’s speechwriters are no doubt working on his retort as we speak. Body-toning footwear like Sketchers Shape Ups and FitFlops may be too good to be true, after all. Time to crawl back to the ol’ gym. Couture is where designers get to live their wildest fantasies. This season, the dream translated to beauty too. 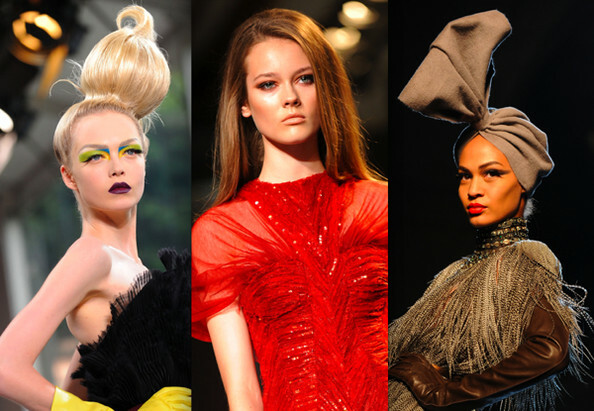 One day at the couture shows can often bring the most varied hair and makeup looks—Fall 2010 was, happily, no exception!